A tiny bird caught my attention the other day. From one set of weeds it would dive into another, always just a few feet from me but never clearly visible. Finally it landed on a fence rail, and then it seemed oblivious to me, pulling long stems of grass over and raking them with its bill to pull the seeds off, and I was able to take some pictures. 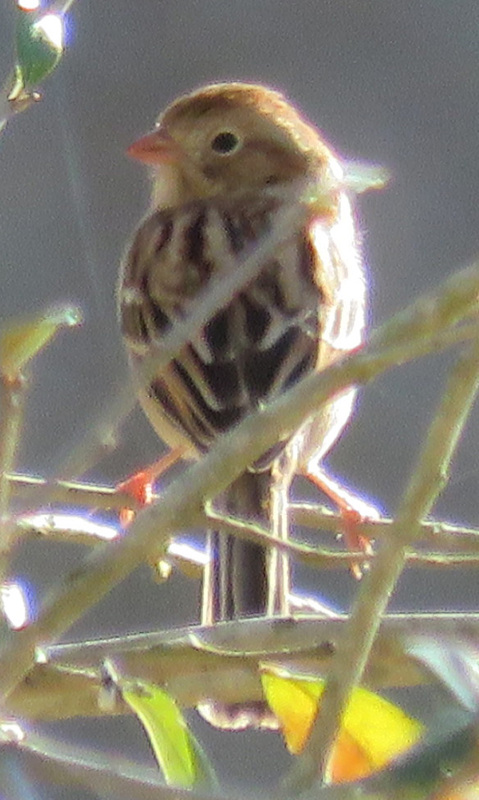 The pink bill would tell me “Field Sparrow” but there’s no white eye ring. I’m sure you noticed that immediately too. Shots from behind can show characteristic patterning. And in this one, I love how the grass stems are just sort of exploding everywhere. 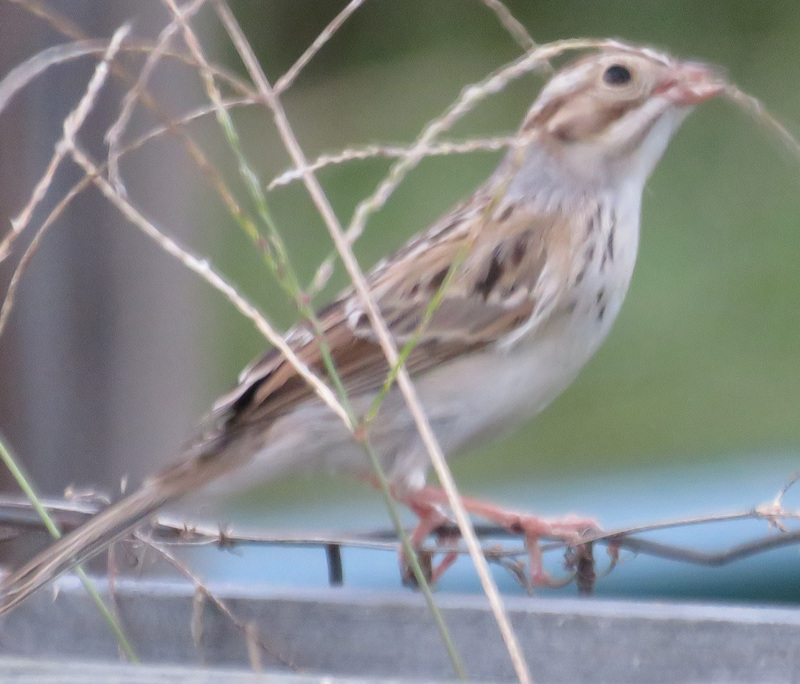 Here is one I know is a Field Sparrow. It just looks different to me than the new one. What do you think? Our most common sparrows are Chipping Sparrows, and this one looked similar, but its swooping and hiding routine didn’t seem at all like their “I’ve been waiting all day – and the feeder is still empty” attitude. So I checked my multitude of bird books and apps but I didn’t find a clear match. When I am trying to identify a bird, I start with a local bird book. This narrows down the range of birds it could possibly be. Then, for more accurate illustrations, I go on to Sibley’s. 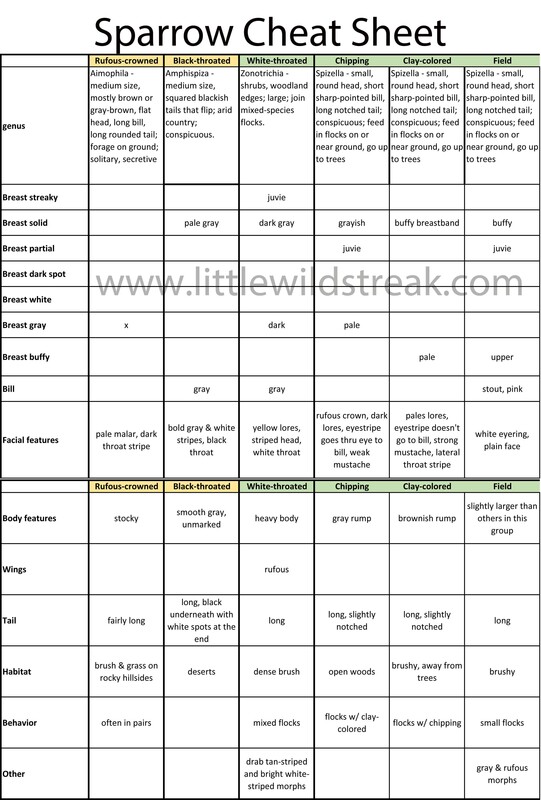 I like the comparison charts at the introduction of each bird group. The charts give me a quick reference as to size, posture, and markings. (However, the charts usually show the females, which may or may not match the bird I have seen.) I also like the way that in the individual accounts, each bird is shown in several flight and resting poses, again for ease of comparison. If I still can’t identify the bird, I go on to all my other books (I have about 10 general bird guides), and this is where the trouble starts. I pick a feature from the bird (let’s say, a pink bill) to hunt for in the species accounts. Sibley’s is the best as far as consistency of information placement on the page, but even in Sibley’s, the same sort of fact in found in different places. A phrase like “pink bill” could be next to the bird’s illustration, or in the description paragraph, or up in the introductory sentence, or even in another species account where it is given as a comparison. Other books seem to have much less consistency in the information they give. For one bird they might talk about the tail, for another the feet, for another its habitat. It’s not their fault; there’s a lot of information to choose from, and they have to make things fit in where they can. And range maps are the most inconsistent feature from book to book — Birds of Texas may tell me a bird is spread across the entire state year-round, but National Geographic Complete Birds of N.A. may show that it’s only in the very tip of South Texas in the winter. The more I look, the more confused I get. So I decided to make my own cheat sheet, or as we called it when I was teaching, a “gathering grid.” I wanted to condense the information from all my books into a quick reference matrix, on only local species. It is far more productive to look at the overall shape, size, and coloration of a sparrow and to classify it as a genus first, then work out which species it is. Identifying sparrows uses somewhat different skills from those needed for the typical approach to bird identification. To identify a sparrow, consider first its shape, then its habitat and habits, and finally its field marks. Each genus has a distinctive silhouette; note especially tail length and shape….Habitat is also useful. National Geographic Complete Birds of N.A. So I used Microsoft Excel to gather the notes. I started with genus, and grouped those birds together. My field guides are from around 2000 — some genera have been added since then, but I didn’t worry about accuracy to that degree; this is just for my own use. I color-coded the species names — blue for East Texas, yellow for West Texas, green for both, purple for the Gulf Coast. I can hide columns and only look at the ones that are appropriate to the region I’m in. Then I flipped back and forth in several books, noting enough just enough details to point me in the right direction when consulting field guides. Gathering these notes helped me learn more about sparrows, and I wish I had thought of creating a personalized guide earlier. I came up with 24 sparrow species that I have a pretty good chance of seeing in Texas, and took about two days to gather up their info. Here is a mini-version, showing just a few species, so you get the idea. Sparrow cheat sheet sample. If you would like the spreadsheet version, just leave a comment and I’ll email one to you. It has 24 species and you can adapt it for your own area. 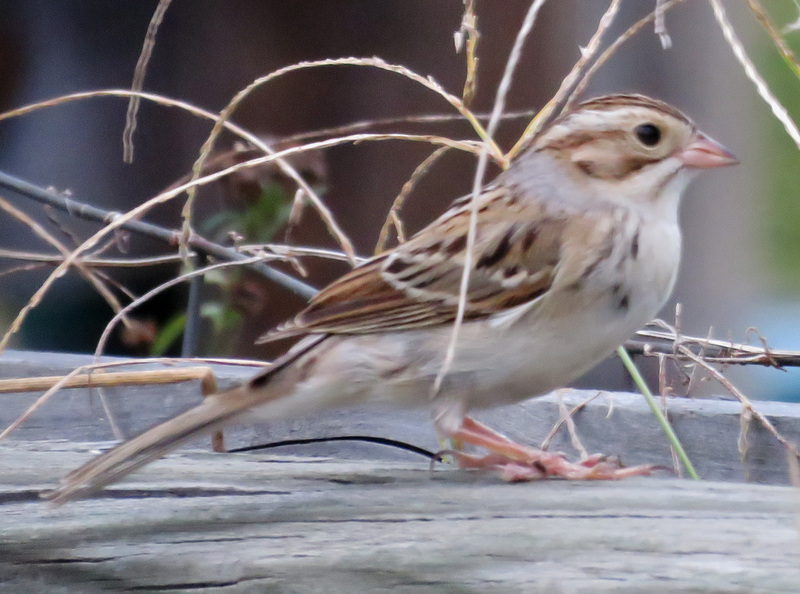 I have decided it is a Clay-colored Sparrow, mostly on the basis of its facial features. I am bringing pictures to some bird experts tomorrow to see if I have guessed correctly. If I have, this will be the 91st species I have seen here on the farm! Amazing isn’t it how much time we can spend searching for an answer we feel should be there. I’ve run into the same situations. Melanie probably rolls her eyes when she sees me get going on a ‘mission’. It is definitely one of their American cousins! That was awesome!! I blatantly copied your sparrow cheat sheet to my desktop. 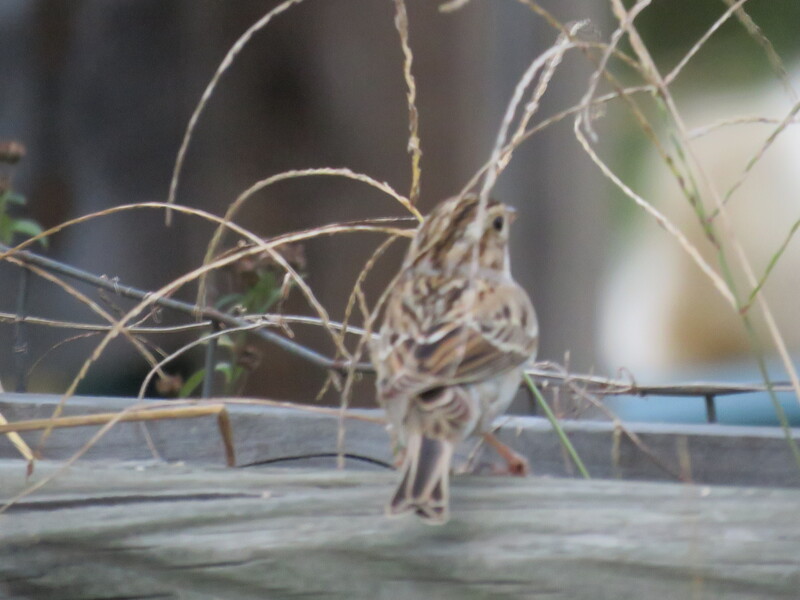 I saw a couple sparrows out my window yesterday and need to identify. They can be so tough! I know they were seemingly impossible when I first began birding, but now they do look different from one another. Thanks for posting that! You are so welcome! If you would like, I can send you the spreadsheet file (free of course), which has 24 sparrows in it. Then you could cut the ones you don’t need, add more info, whatever, to make it reflect your area. I want a cheat sheet please! You know most of the birds at my feeder are sparrows, and I have actually spent a good bit of time with Sibley’s and always come up at a loss. It’d be fun to figure out a LBB now and then.